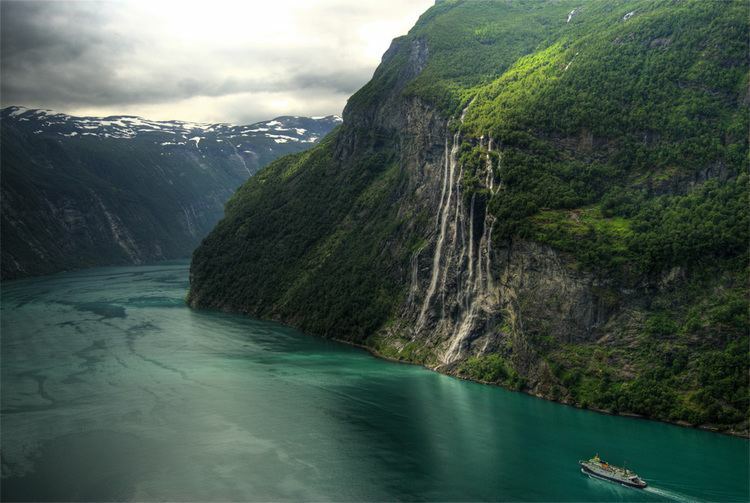 Møre og Romsdal [ˈmøːrə ɔ ˈrumsdɑːl] (Møre and Romsdal) is a county in the northernmost part of Western Norway. It borders the counties of Sør-Trøndelag, Oppland and Sogn og Fjordane. The county administration is located in the city of Molde, while Ålesund is the largest city. 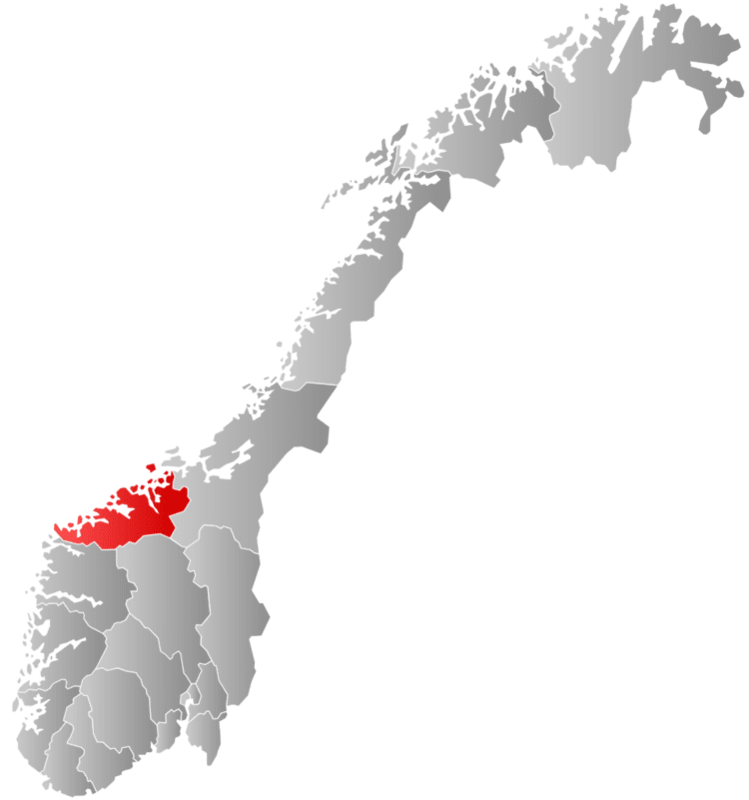 The county is governed by the Møre og Romsdal County Municipality which includes an elected county council and a county mayor. The national government is represented by the county governor (currently Lodve Solholm). The name Møre was chosen to represent the region where the majority of the county residents lived. That name is old (Old Norse: Mœrr) and it is probably derived from the word marr which means "ocean" or "sea". The meaning is then "coastal district". (There is also a coastal district in Sweden that has the same name: Möre.) 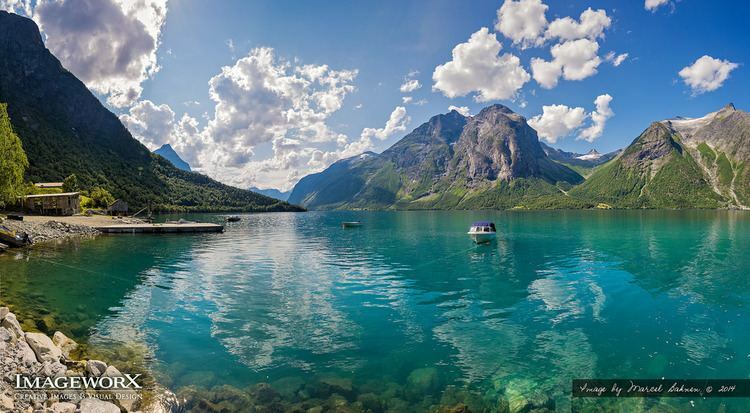 The change in name from Romsdalen to Møre was controversial and it did not sit well with the residents of the Romsdal region. 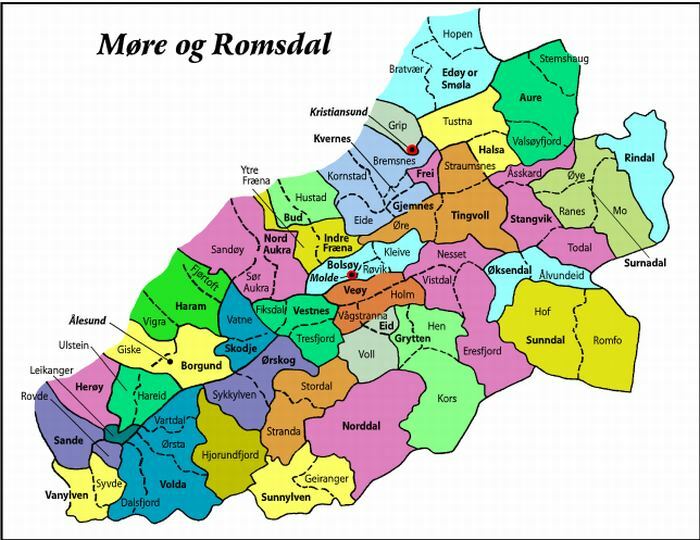 Finally in 1936, the name was changed again to a compromise name: Møre og Romsdal (English: Møre and Romsdal). The ambiguous designation møring—"person from Møre"—is used strictly about people from Nordmøre (and less frequently for people from Sunnmøre), excluding the people from Romsdal (while, consequently, romsdaling—"person from Romsdal"— is used about the latter). The coat-of-arms is from 1978. It shows three Viking ships (where the masts and the yards create three crosses). The number of three represents the three districts of the county: Sunnmøre, Romsdal and Nordmøre. Møre og Romsdal has six settlements with city status. The largest three were cities before 1993 when municipalities were allowed to grant city status which led to an increase in the number of cities. The county contains multiple other urban settlements (as defined by Statistics Norway) without city status, every municipality except for Halsa and Smøla contain at least one. As of 1 January 2009, 166,374 people (66.8 percent of the population) lived in an urban settlement. The population density is highest near the coast, with all of the county's cities located on saltwater. The largest city in the county is Ålesund, with a population of 45,747 in the municipality and 49,528 in the agglomeration which it forms together with parts of Sula. Møre og Romsdal has a total of 36 municipalities. There have been many other municipalities since 1838 when municipalities were introduced in Norway, but those have merged with other municipalities over time. Møre og Romsdal is served by nine airports, of which only the four airports located near the four largest centres have regular domestic flights. The largest airport in the county is Ålesund Airport, Vigra, which offers the only scheduled international routes from any airport in Møre og Romsdal. Ålesund Airport had 732,614 passengers in 2006. Kristiansund Airport, Kvernberget had 364,350 passengers in 2007, while Molde Airport, Årø had 401,292, down from 444,677 in 2006. Ørsta-Volda Airport, Hovden had 49,842 passengers in 2006. None of the airports in Møre og Romsdal offer regular flights to each other. 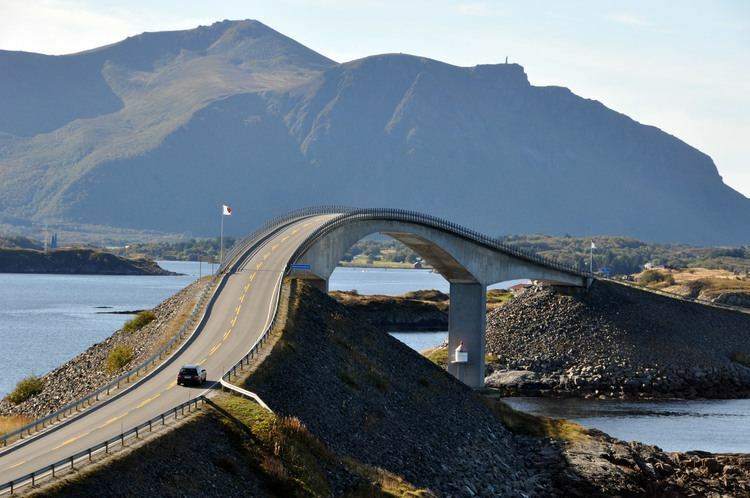 In 2007, Møre og Romsdal had 6,339 kilometres (3,939 mi) of public roads, an increase of 5 kilometres (3.1 mi) since the previous year, as well as 4,258 kilometres (2,646 mi) of private roads, 7 kilometres (4.3 mi) more than in 2006. There is one railway, the Rauma Line, which starts at Åndalsnes and connects to the main railway network of Norway. Public buses are operated by the county, using the brand name Fram. The county (with its current borders) was established in 1671 - but after just four years (in 1675) it was divided into two amts (counties): Romsdal (which included Nordmøre) and Sunnmøre (which included Nordfjord). In 1680 (only 5 years later), Sunnmøre (including Nordfjord) was merged into Bergenhus amt. 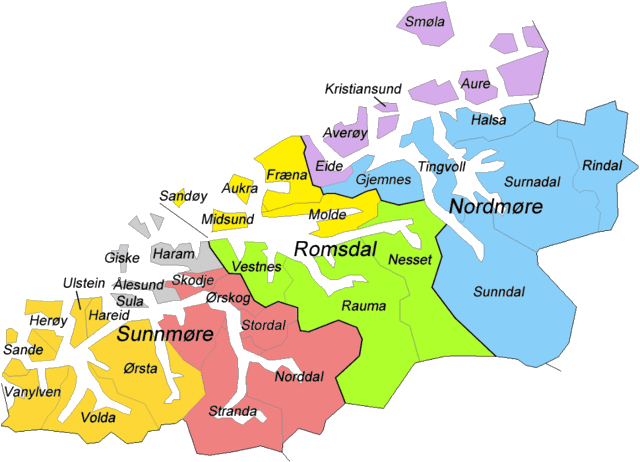 Then in 1689 (another 9 years later), the three regions of Romsdal, Sunnmøre and Nordmøre were again merged into one amt/county: Romsdalen. Then in 1701 (another 11 years later) Romsdalen amt was split and divided between Trondhjems amt (which got Romsdal and Nordmøre) and Bergenhus amt (which got Sunnmøre). 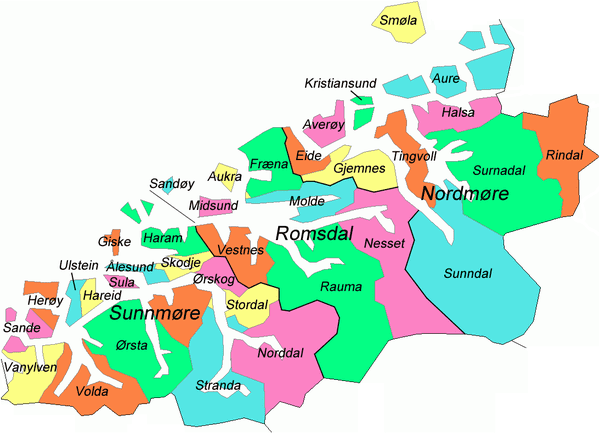 In 1704 (a mere 4 years later), the three regions of Romsdal, Sunnmøre and Nordmøre were again merged into one county. The borders of the county have not been changed since 1704 - with the exception that the annex Vinje of Hemne parish was transferred from Romsdalens amt to Søndre Trondhjems amt in 1838 (according to the 1838 Formannskapsdistrikt law, a parish could no longer be divided between two counties, so Vinje had to be in the same county as the rest of the parish).